Roadware Flexible Cement II™, the advanced concrete repair material that is easy to apply and stays in place permanently under thermal or shock movement. This moisture tolerant two-part urethane is great for repairing cracks and control joints subject to deflection, movement, and thermal expansion or contraction. Flexible Cement is perfect for protecting saw-cut control joints in new concrete construction or repairing failed polyurea or epoxy joint fillers. Cartridge applied Flexible Cement II™ has a slower gel time than polyurea so spot repairs can be made throughout a facility with one cartridge. Original saw cut control joints are filled with semi rigid epoxy or polyurea. The concrete shrinks as it cures for the first year causing the joint to widen and the filler to fail. Use Flexible Cement II™ to re-fill control joints where some future movement is anticipated. Use Flexible Cement II™ to repair cracks, joints and spalls in concrete floors, slabs and surfaces. This video demonstrates bulk mixing techniques and application in a concrete driveway prior for applying a decorative concrete overlay. 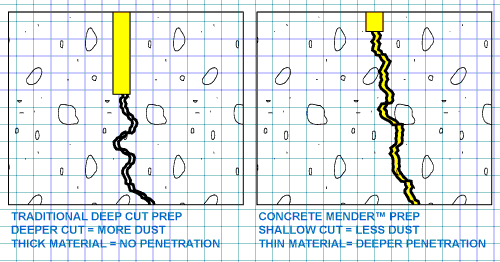 Roadware Flexible Cement II™ will fill joints ad cracks as well as prevent them from reflecting through the overlay. This material cures in minutes and may be coated within 20 minutes after application. Roadware Flexible Cement II 600ml Cartridge.